Howdy folks! Hopefully everyone had a nice holiday, and we’ll be capping the week off with a look at Tug of War! Tug of War is a metagame dependent tech card, but its wide array of applications makes it a strong choice for numerous builds. In many matchups, you’re much more likely to have a card be discarded as damage than drawn into your hand. This makes cards with Endurance extremely valuable, but Tug of War also has the bonus of banishing an Ally when discarded. Banishing lots of Allies, one arm at a time. Tug of War doubles down on Ally removal when it is played from your hand, chipping in some anti-anger to boot. In matchups with a few utility Allies, Tug of War provides a permanent 1:1 answer. Against an Ally swarm, a single copy has the potential to easily banish several Allies throughout the course of the game. Finally, it shuffles itself into your Life Deck after use. This recursion makes it more likely for the parenthetical text to activate, and in a worst case scenario you have shuffled your deck and added some Endurance. The usefulness of shuffling your deck is often overlooked – even aggro can benefit immensely from access to Rejuvenated cards. The shuffling ability also has a favorable interaction with Namekian Knowledge Mastery, turning Tug of War into a mini anger control engine. With coverage of this Organized Play season winding down, we’re looking to restart the Mailbag on a regular basis. Make sure your voice is heard! 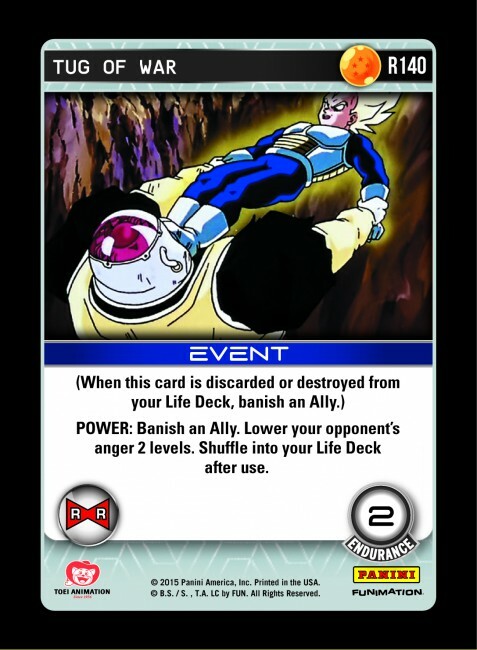 Send your questions, comments, or anything else DBZ TCG related to dbz@paniniamerica.net with “MAILBAG” in the title – your letter might be featured here!